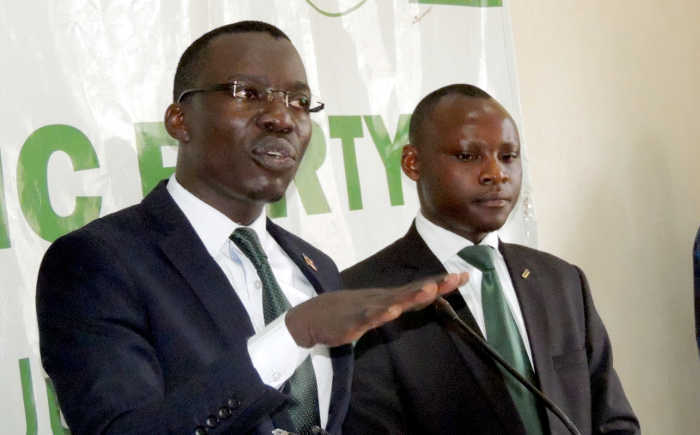 The Democratic Party (DP) Secretary General Dr. Gerald Siranda has blamed the new forum for democratic change (FDC) president Patrick Amuriat Oboi for carrying out some changes in the leaderships of the opposition in Parliament without carrying out consultations. “We were not consulted. I tried to inquire from UPC [the Uganda People’s Congress] it’s the same [case]. Even the current Leader of Opposition was not consulted before these changes were made yet all of us are members of opposition,” Siranda said. Siranda made these remarks while addressing the press at the party headquarters in Kampala this morning. He urged all opposition parties to unite if they are to take power from the National Resistance Movement. “If we continue dividing ourselves like this only Museveni will benefit from it,” Siranda said. He added that as opposition, should strive to take charge of the country and provide the better alternative for leadership, not fighting for posts. He applauded Winnie Kiiza for the work she did while As Leader of Oposition. “We salute Winnie Kiiza for the courageous leadership she has exhibited in the difficult situations. She has served with distinct,” he said. Kiiza is known for standing firm during the period when the opposition was facing a lot of challenges in the parliament, mostly during the time of Togikwatako campaign whose bid to stop NRM from scrapping the presidential age limit failed. Last Friday the FDC President made some changes where Gulu Municipality Woman MP Betty Aol Ochan replaced Winnie Kiiza as the new Leader Of Opposition the (LOP). In other changes, FDC President Patrick Amuriat Oboi named Kawempe South MP Mubarak Munyagwa as the Committee on Commissions, Statutory Authorities and State Enterprises, replacing Abdul Katuntu. The Democratic Party’s Betty Bakireke Nambooze was appointed as the representative of the Commonwealth Parliament Association while Roland Mugume, the Rukungiri Municipality MP, is now the new head of the Inter-Parliamentary Union. Budadiri west MP Nathan Nandala Mafabi, the Party Secretary General and the Former Chairperson of the Public Accounts Committee has bounced back into his old post as head of PAC. Kira municipality MP Ibrahim Ssemuju Nganda, the party spokesperson, retained his position as the Opposition Chief Whip, while Obongi county MP Hassan Kaps Fungaroo retained his chair for the Committee on Government Assurances and Implementation. Dokolo district Woman MP Cecilia Ogwal was replaced by Buhweju County MP Francis Mwijukye as a Commissioner of Parliament.